It is the near future. Overpopulation has put the world at dire and immediate risk. The world's scientists have determined that the situation is so desperate that the only possibility for survival is via immediate and dramatic global depopulation. This puts the fate of the world in the hands of those leading superpowers, and their ability to make the difficult decisions required keep humanity intact. You are one of these leaders. You have access to biological horrors and the authority to decide who to use them against. You hold the launch keys for your nation's nuclear arsenal, essentially serving as vengeance weapons to rain down on those who defy your leadership. Military might, cyber warfare, terror infrastructure and a stable of diplomats are at your disposal. Will you focus on serving the greater good and playing your part as a harbinger of death? Or will you take advantage of the chaos for diplomatic gain, protecting innocents and expanding your own sphere of influence? 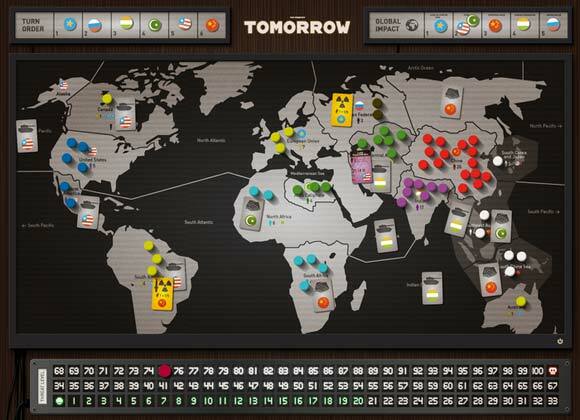 Each playable nation in Tomorrow is radically different: China and India have massive populations to protect and must negotiate with other players to ensure survival. The United States has a military arsenal without peer and the ability to project power seemingly without restriction. Russia has more nukes than they can possibly use. The European Union is a diplomatic power, while the Arab Caliphate has an extensive terror infrastructure with which to torment their antagonists. However, while each position has very different strategic considerations, ultimately the winner will be decided by who best plays their opponents. 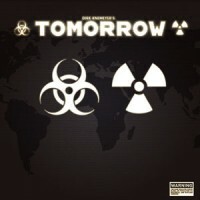 Add a Review for "Tomorrow"